Lock in a great price for Guesthouse Kachari – rated 8.2 by recent guests! The lights are a little bit dim at night, and I think the meals are not worthy of such price. But except these things, my stay experience was nice. The hostess is a serious cook. Our meals were a remarkable assortment of different dishes, each of which was delicious. The fried eggplant dish she cooks is incredible. The hostess speaks Svan, Georgian, Russian, and a bit of English. Her very nice son speaks excellent English. Rooms are clean. Mattress are surprisingly firm and reasonably comfy. The location at the top of Zhibiani hamlet 2 mins walk from Lamaria is as good as it gets. We met really interesting guests there too. The owner is extremely charming and helpful. We had a puncture in our car tire and she got the local military expert (no idea where he came from in this extremely remote village) to fix it. She cooked two great dinners for our family. Very nice and helpful host, tasty food and drinks, location close to the start the path to Shkhara glacier. Rooms are basic but clean. Nice and clean bathroom. We felt really well. Actually, if you want a luxury, an airconditionned full service room, please don't waste your time here and choose a hotel in Switzerland. If you want to try to adapt to a hard local life for a moment, no problem here. This house is well clean, the water in shower warm, although , maybe,you will have to wipe the bathroom afterwards. 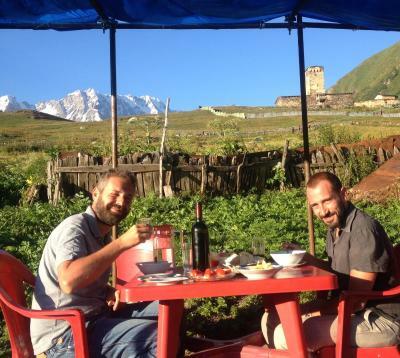 In general, we love selfcatering but highly recommend to buy a dinner here, it was great and with shopping and prices in Ushguli, it is well worth to buy the dinner here. We cannot judge the breakfast, we havent tried that because we usually eat just something quick small in the morning. The location is perfect, at the end of the village. You can enjoy the marvellous view while eating in the garden. Nina did a great job in making us feel at home by serving tasty food in abundance. while the room is very basic, everything else is perfect - the hospitality, the food (served in the garden with one of the best possible views), table wine is honestly priced and so are the transfers with the Family's SUV. Very friendly staff, nice and cozy rooms, amazing food! Very nice hostess, nice room and good localization. 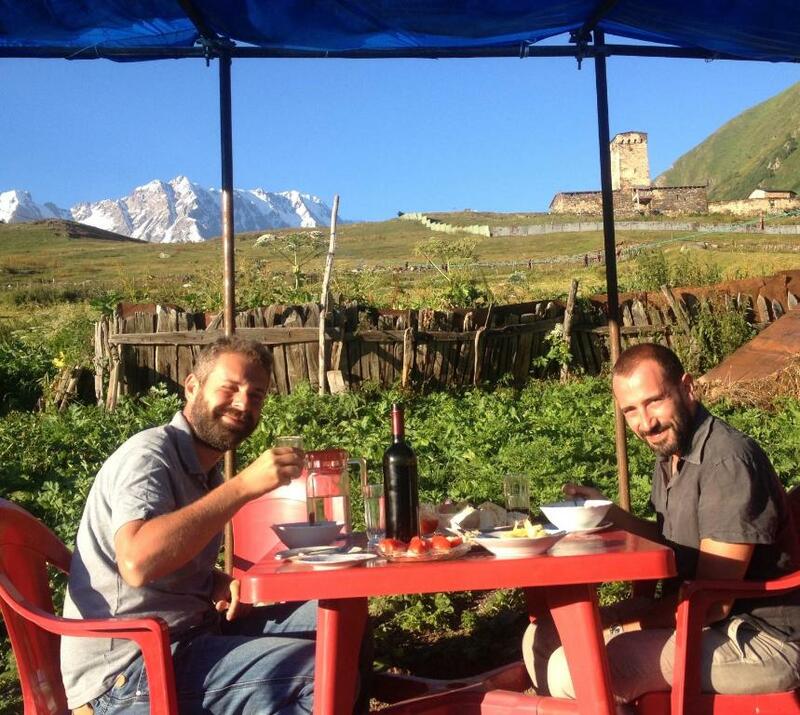 Offering a restaurant, Guest house Kachari is located in Ushguli Village. Each room here will provide you with air conditioning and a seating area. Extras include an outdoor seating area, bed linen and ironing facilities. At Guest house Kachari you will find a terrace. Other facilities offered at the property include a shared lounge. An array of activities can be enjoyed on site or in the surroundings, including horse riding, fishing and hiking. The property offers free parking. When would you like to stay at Guesthouse Kachari? 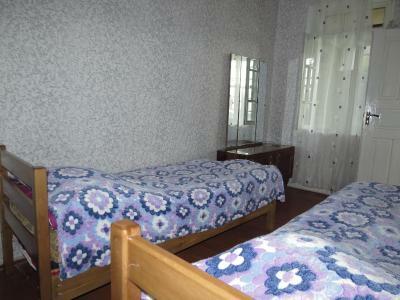 This triple room has a dining area, seating area and air conditioning. House Rules Guesthouse Kachari takes special requests – add in the next step! Any additional children or adults are charged GEL 15 per night for extra beds. Personal driver service is available at surcharge upon request. Please inform Guesthouse Kachari of your expected arrival time in advance. You can use the Special Requests box when booking, or contact the property directly using the contact details in your confirmation. It is not 100% perfect, but it is a friendly nice clean place. The bathroom was not very hygienic. Very friendly and helpful stuff. Great food. Nice localization. Nicely located at the end of the village where the glacier trails start. The family was very helpful and the husband drove us very safely back to Mestia! We got dinner and breakfast. Only one night, but highly satisfied! The breakfast was over priced, 15 Lari, especially as it consisted half of what was left over from dinner the night before. The bedroom has no exterior windows & is cold but there are just enough blankets. Be prepared for no WiFi (it's available FoC at the first restaurant by the marushka car park), and a power cut or two during your stay (unavoidable anywhere in town). This is a great budget choice. Excellent location at the top of the village (but this does require a 10 min up hill climb from the marushka car park or pay for a taxi). Great views from the dining room and garden. Good value, 15 Lari, dinner with authentic local dishes. The landlady is very nice and helpful, a very good experience living there. Given where we were, it left little to be desired. Bedroom clean, family very friendly and good kitchen, but only one bathroom that was not very clean - due to the fact that the shower is not separate and leaves the floor wet after showering. So everybody using the toilet afterwards has to step on a wet floor and this makes the room look dirty very quickly. During the first nights we were asked if we would like to have dinner at their place. Since we have travelled quite a bit prior to arrival we agreed. What a pity. For GEL 20 each you can have good dinner around the corner. After a disappointing dinner, we went to bed, the comfort of the bed was so-so at maximum. Even though we had a luxury room. The difference between a regular room and the luxury is a window to the outside world, normal rooms don't have a window! In the morning, for breakfast we were served pasta, French fries, rice and so on, we have experienced having these dishes for breakfast more often in Georgia, however, not with such poor quality. Good thing though, upon request the bread was changed from 'western factory style'-bread to fresh Georgian bread and the eggs were fine in the morning. 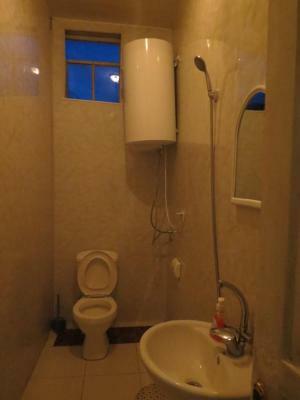 With four rooms, there were two cabins containing a toilet and shower. The shower makes everything wet, including the toilet. During the last night we stayed at this place, another couple booked the 'comfort room', meaning one the cabins was shut down for the three other rooms. We were happy to leave the day after. The staff arranged a marshrutka for us to Mestia, we agreed GEL 150 for the whole car. However, we picked up some other people and then the price only got higher, instead of the share for us to become lower. In general, this place promises more than it is able to provide. The staff doesn't speak any English, although promised on our booking website. To conclude, it is way too expensive. You don't pay for what your get here. Move somewhere else instead. We could use the laundry machine free of charge.